Michigan adoption records are sealed and generally inaccessible to the general public but that does not mean that you can’t find your birth parents, your parent’s birth parents, or an adopted sibling. All of this is possible with a little know-how, a bit of determination, and a load of persistence. My name is Jay Kruizenga and I’m an independent genealogist based in the State of Michigan. I’ve successfully assisted several individuals with their “sealed” adoption issues. And I am certain I can help you as well. This article offers free advice to you that you can take and utilize in your own self-help process should you feel up to the task. Or I can be hired to assist. I charge a one-time $300 fee for my time and labor. There are methods allowed by Michigan Law where an adoptee and/or a direct descendant of an adoptee can legally request non-identifying or identifying information pertaining to the adoptee in question. So, if you are an adoptee in search of a birth parent or a full or half blood sibling, or if you are a direct descendant of an adoptee and have hit a brick wall in your family tree…don’t despair. There is hope! And I know, because I’ve been successful in placing families back together. The law as it pertains to all Michigan-based adoptions is found in the Michigan Probate Code, sections 710.68 and 710.27. What follows is a digestible summary of that code. Are you an Adult Adoptee? If you are an adult adoptee, defined as an adopted individual over the age of 18, then you have certain rights by Michigan Law. You have the right to request from either the adoption agency or the probate court all non-identifying information pertaining to your birth parent(s). By law this information must be delivered to you in written form within 8 weeks once requested. The information you receive can be used to search for the identity of either parent using public records such as city directories, birth and death records, etc. It all depends on how much information is available and what is then received. This varies accordingly but is typically quite useful. How do you request your record? As an adult adoptee you can request your non-identifying information from the adoption agency that handled your adoption. If you do not know the name of the agency then you can request this information from the probate court within the county where you were placed for adoption. The probate court has 4 weeks (by law) to give you this information. And the adoption agency has 8 weeks (by law) to supply the non-identifying information once you request it. What you will receive will vary. It all depends on how much information was collected by the adoption agency at the time of adoption. 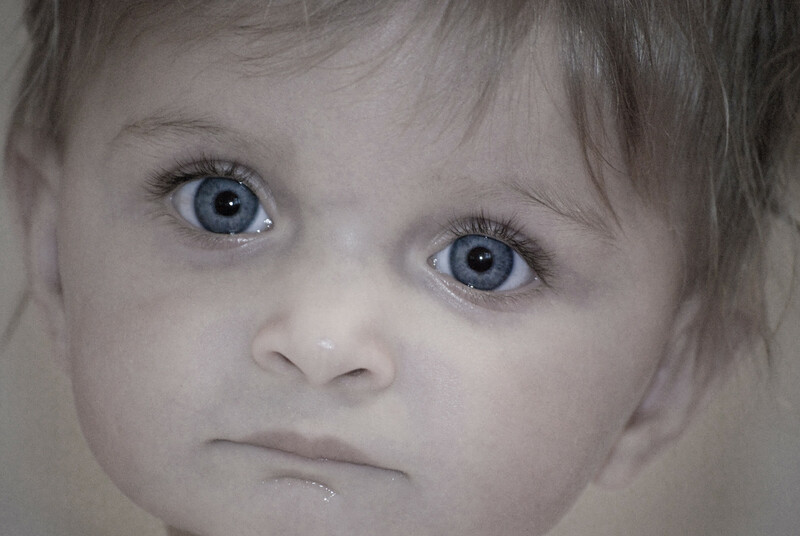 Probate courts generally do not have the wealth of information found at the adoption agency. Therefore, we request information direct from the agency rather than the court. Your birth name before adoption. Name(s) of Parent(s) at time of termination of parental rights. Most recent name and address of parent(s). Names of biological siblings at time of termination. Name of the Parent at time of termination of parental rights. Most recent name and address of that parent. For adoptions where parental rights were terminated before 28 May 1945 or on/after 12 September 1980, the agency or court will release all identifying information to an adoptee unless a former parent has on file a statement (waived at death of the parent) denying consent. If an adult adoptee wishes to receive information pertaining to an adult former sibling, the agency/court will submit a clearance form to the central adoption registry and then has 28 days after a reply is received to notify the adoptee in writing of the name/address of an adult former sibling – if a statement is on file. If neither of the birth parents have a statement denying consent on file, then a copy of the clearance reply form will be released to the adult adoptee. This form can be used to obtain the adoptee’s original certificate of live birth. Again, this only applies to those adoptions in which parental rights were terminated before 28 May 1945 and on/after 12 September 1980. Fees are set by Michigan Law to $60.00 (or actual cost of supplying information), whichever is less. But this fee may be waived if indigent or under hardship. Many genealogists, myself included, have brick walls in our family tree where we run into a person that was adopted. Can we request information about our ancestor from the State of Michigan? Yes, we can. 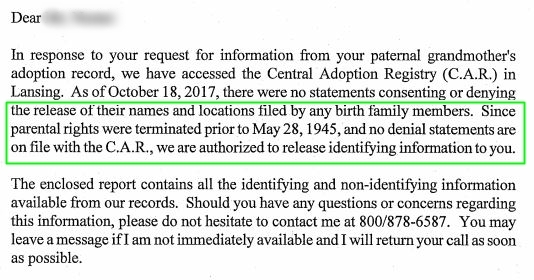 (20) A direct descendant of a deceased adult adoptee may request information under this section. All information to which an adult adoptee is entitled under this section shall be released to the adult adoptee’s direct descendants if the adult adoptee is deceased. Therefore, if the adult adoptee is deceased, a direct descendant (must be proven) will be treated as if he/she were the adult adoptee and receive the equivalent information authorized by law. I had a recent client that stumbled upon an adoption in her family tree: her paternal grandmother. Not knowing how to circumvent this brick wall, she contacted me for assistance. We knew the grandmother’s adopted name and knew the time of her birth. She had been given up for adoption at birth. Armed with this information I contacted the probate court within the county where the adoption took place to discover the name of the adoption agency. The probate court had information that was shared: the birth name of the grandmother and the agency that handled the adoption. That agency was no longer in existence, so I cross-referenced existing agencies to find which had the records from the former. Once the proper agency was found it was a matter of my client proving relationship, paying the $60 fee, and waiting for the information. It was properly delivered, as promised, near the 8-week mark. The file contained precisely what she had been looking for – the birth name of the grandmother’s father. And the brick wall was circumvented. In my own family tree, I had a brick wall in my paternal great-grandmother. A letter was found written to my grandmother, once my great-grandmother had passed, that explained that the man she knew as her father was not her biological. Unfortunately, no name was given. In my great-grandmother’s pocket purse was a small worn photo of a balding man, perhaps in his early 40s, dressed in working clothes, wearing a soiled apron, sandals, and a cap. He stood in front of the double doors of a garage. His fingers were stained. I contacted the probate court to see if any information could be found pertaining to my grandmother’s adoption. She was born in 1921 and my great-grandmother married in 1923 the man whose name appears on the birth certificate. The probate court supplied me the name of the birth father. Unfortunately, the name was fictional. My great-grandmother had given a bogus name – probably pushed for the information during birth. She wanted to protect the real father. I had to circumvent this issue. But how? I examined the lives of her four sisters. One of the sisters, unbeknownst to the family, had been previously married in 1918. The marriage did not last but a year and ended in divorce on grounds of extreme cruelty. But what was interesting was found on her marriage certificate. It gave my great-grandmother as one of the witnesses to the marriage alongside another man. That man was brother to the husband, of the right age, and worked as a brash polisher in an instrument factory. There he was! Or so we thought. I have since proven otherwise using DNA. But that is another story for another time. The point is, the probate court is willing to work with you in the bounds of Michigan Probate Law. It’s not difficult to do. You can do this too. It you do need my assistance, I am more than eager to help. But first you will need to request the name of the adoption agency from the court wherein your adoption took place. DNA can be a useful tool in your search for birth parents or siblings. In a recent case I helped construct a full client family tree based only on her DNA. She knew nothing about either side of her birth family. She had non-identifying information that proved useful once the tree was constructed to point to the identity of both her parents. This took many hours to construct but proved worth our time. Unfortunately, in my client’s case, her birth mother had passed from a plane crash and her birth father wanted nothing to do with her – even denying her existence. But not all was lost. We found a maternal aunt who was more than willing to welcome her into the family. And it remains a happy story. What DNA company should you test with? I am asked this on a regular basis and my answer is always the same. As many as you can afford to. Why is this? Taking a single DNA test with one company will leave many family connections unfound. The truth is that we don’t know what company our relatives on either side may have tested with. I’ve found connections using this method that would never have been found otherwise. And in the case just discussed this was crucial. There are 4 large companies that I highly recommend. These companies offer substantial discounts if you have time to wait. These discounts take place around holidays – so it is important to watch for them. Perhaps one of the largest databases available. Due to their ample advertising for ethnicity results many people from curiosity submit their DNA sample to find their ethnic composition. Problem is once these people learn their ethnicity, they abandon Ancestry never to return. However, Ancestry is extremely useful and comes highly recommended. The base price is $99. This goes on sale for $79 and sometimes $59 based on holidays. At the time of this writing MyHeritage, a strong competitor to Ancestry.com, offers a free membership. This free membership includes a free upload of your AncestryDNA results. A brilliant marketing tool for MyHeritage that makes their database one of the largest. Their base price if $79. Goes on sale for $59 on occasion. But you won’t need to pay either price if you simply follow these steps. 2. Select DNA from top menu. 3. Select the Settings tab under your name upper right. 4. Click “Download Raw DNA Data” the gray bar in the right column. 5. You will be prompted for your password and must check a box concerning security measures stating that you assume all risk. 6. You will then receive an email from Ancestry where you must confirm data download by selecting a green button. 7. Selecting that button will open up a new window in Ancestry where you must once again select the green button that reads “Download DNA Raw Data”. 10. At present (may change in future) – you will see an orange box that reads “Start your family tree”. Select it. 11. Here you will create your account. Enter all information and select “Get started”. Follow additional prompts until you have set up your free account. 12. Once your MyHeritage account is set up, log in to your free account. 13. Browse to the DNA tab from menu across top of page. Select upload DNA data. 14. Select the purple start button. 15. You must then select both checkboxes in the gray area and then “upload”. 16. This will prompt you for the zip folder you downloaded from Ancestry. Find this and click open from the new window. 17. This will upload your Ancestry results for MyHeritage to digest. This can take a few days (or weeks). Keep checking your free acccount for new information. 23andMe offers a couple options, one with health features added in. $99 for the base DNA package. $79 for the family finder package. By spreading your DNA across all four of these large databases you are setting up a better mousetrap to find relatives, close and distant. If you can afford to, I highly recommend purchasing all the above – except for MyHeritage which for the time is free. If you can’t, at least take an AncestryDNA test and upload your results to MyHeritage. Let me know if I can be of assistance to you. My advice is free. To use my services my low one-time cost is $300 for the basic package that includes a basic search, contacting probate courts and agencies, and completing necessary paperwork (that you will need to submit because I can’t by Michigan Law). There is an additional $60 fee paid to the agency for the information (this does not go to me). 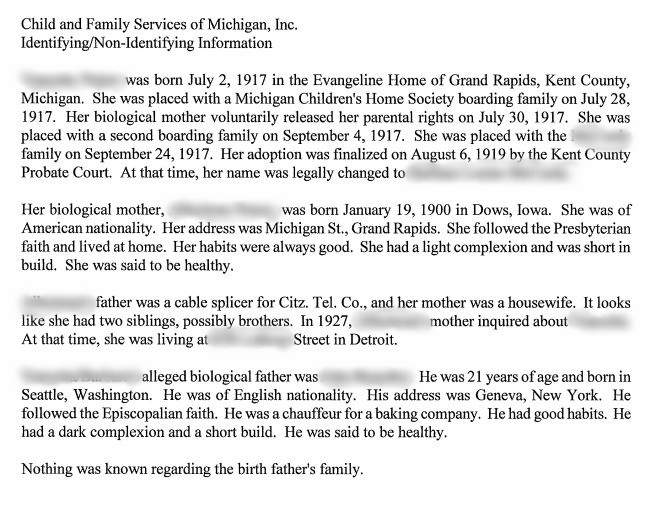 Below is a sample identifying report from an adoption agency received by a former client with names smeared to protect client identity. You can imagine my client’s joy when she received this report with full identifying information! If there is anything we can assist you with, please complete the form below. Are You Seeking My Professional Help?